Do you have an important evening planned that you’ve been waiting weeks to enjoy? You have the perfect outfit. The perfect hair style. The perfect make-up. The perfect shoes. Now you just need the perfect finishing touch—the right Miche. 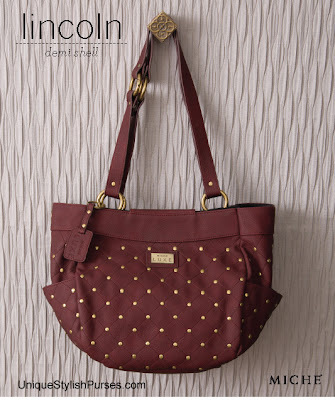 The Lincoln for Demi Bags is your go-to choice for any special occasion. Ultra-rich deep maroon faux leather in a diamond pattern is offset by the delicate shine of a myriad antique brass rivet accents. Side pockets.